SculpSure has just received FDA clearance for reduction of fat in the submental (neck or under the chin) area. 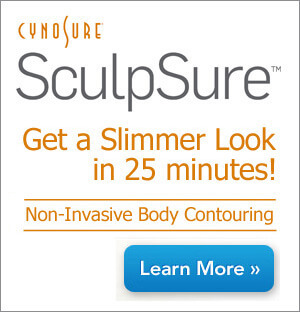 This is the sixth clearance for this totally non-invasive body contouring (shaping or fat reducing) technology. SculpSure uses laser light to heat fat cells to a point that shocks the cells causing cell death and clearance of the fat over several months. SculpSure produces death and removal of fat cells (permanent fat reduction), like liposuction but unlike dieting. SculpSure has some particular advantages for the submental area. Dr. Bass has been impressed by the dramatic contour reduction seen with two treatments. A heating approach also seems to contribute to good skin redraping (lifting/tightening) associated with the fat reduction, in Dr. Bass’ opinion, although this is not a treatment for skin laxity. Most importantly, MRI results in study patients have demonstrated that fat under the muscle layers (sub-platysmal fat) is reduced in addition to a reduction of fat immediately under the skin (subcutaneous fat). This is a unique finding which is not produced by Kybella injections or even by liposuction. The only other way to achieve that kind of fat reduction is during open neck surgery during necklift. This gives SculpSure a unique advantage over some of the alternatives in Dr. Bass’ opinion. SculpSure is not a weight loss treatment –it will not change the number on the scale but it will partially flatten bulging areas of fat in one or more treatments. The degree of fat reduction tends to be less than that obtained with liposuction even after multiple treatments but the treatment is completely non-invasive, does not require anesthesia and has no recovery time. You can immediately return to work, exercise, sports or a bathing suit immediately after treatment.